I back from a spare of the moment upstate NY skiing vacation. Nick starts a new job tomorrow so we decided to make the most of the time off and go weekday skiing. Skiing on a weekday is really the only way to do it. We went to Hunter and had the slopes to ourselves! Also, the weather has been brutally cold here so skiing is just about the only logical outdoor activity. I actually thought about writing a post about all the food that I brought with me for the four days we were there, but then I got lazy. At some point I will share what I eat when I travel because there is an easy way to go away and eat healthy as well as not worry about eating something that might disagree with your stomach. But enough about what I’m up to, let’s talk carrot cake! 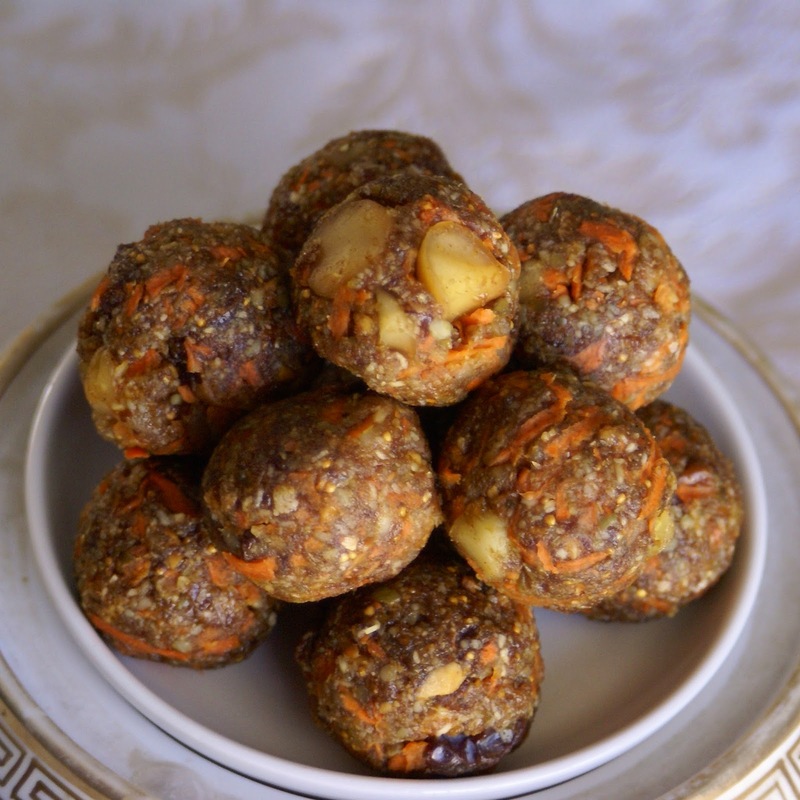 I give you raw, energizing, decadent, carrot cake bliss in a convenient pop-able ball. They are raw, grain-free, and free of sugar and oil. 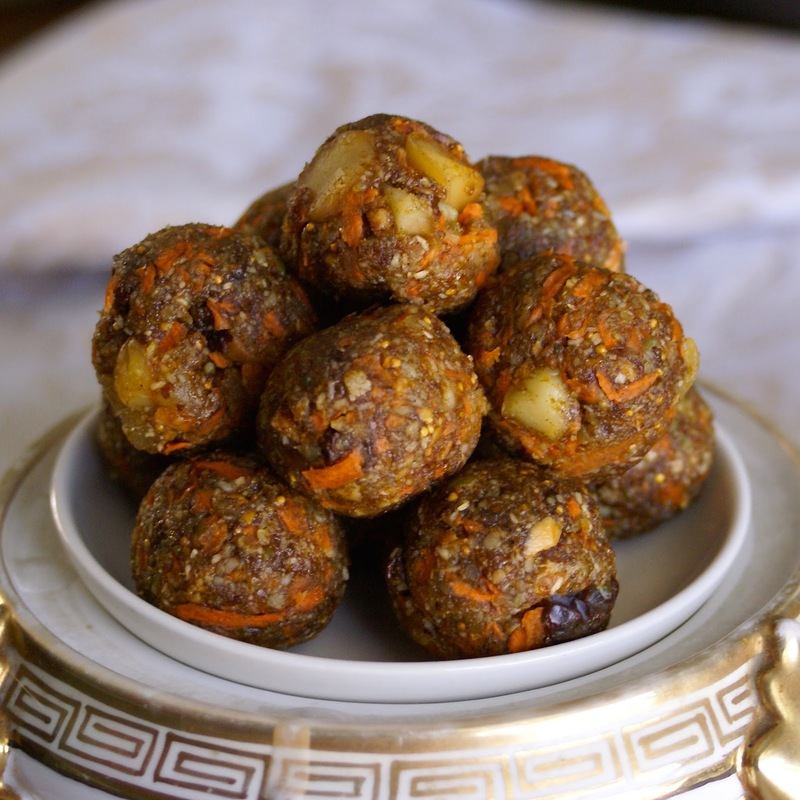 Fruits, seeds, and nuts make up these little energy balls meaning they are a great grab-and-go snack or afternoon pick-me-up. It just so happens that they are SO tasty, I made them instead of a cake for my aunt’s birthday. Ok, that’s a lie. I made her an orange chia oat cake as well, but I didn’t need to with these carrot cake bits. Everyone loved them! My family was actually arguing of who could take the leftovers home. 1. Process the pumpkin seeds and shredded coconut until a meal consistency forms. 2. Add the cinnamon, ginger, nutmeg, and salt. Pulse till combined. 3. Slowly add the dates and figs with the processor running. Process until all large chunks are gone. Add the molasses and vanilla. 4. Pulse in the grated carrot. Then pulse in the raisins, roasted nuts, and candied ginger (if using). 5. 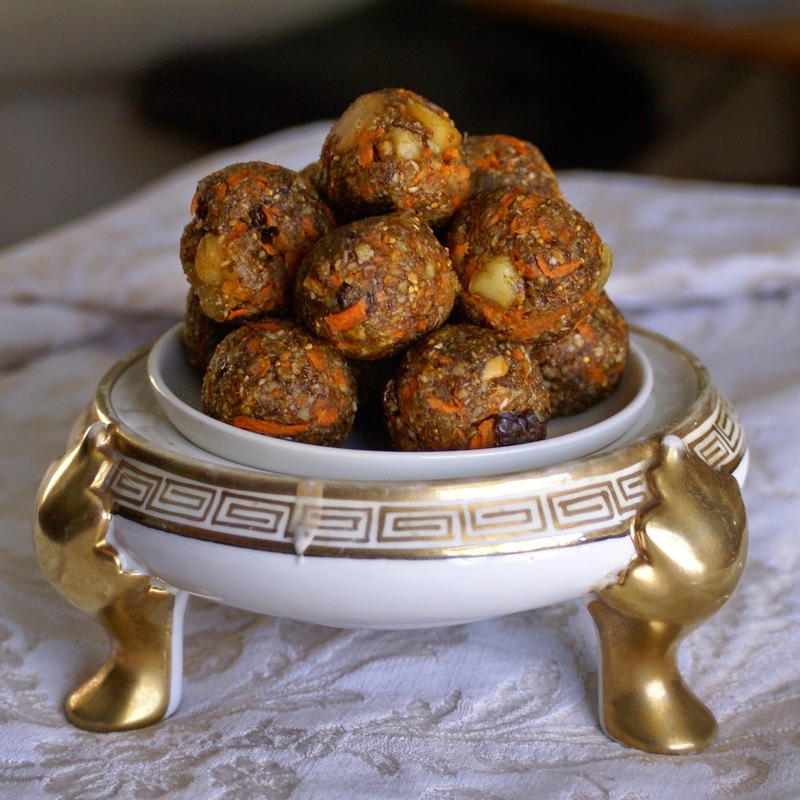 Scoop the dough out in tablespoon-sized balls and gently roll to shape in your hand. Place in the fridge for 1-2 hours to set before serving. Store in an air-tight container in the fridge or freezer.